Today: A classic braised lamb shoulder -- with a modern sauce -- for a cold winter's night. Mint is a classic accompaniment for lamb. 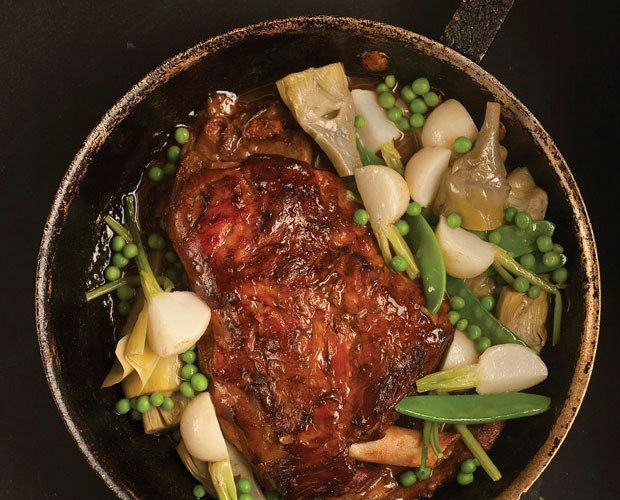 And it wasn't until Jennifer May shot this classic braised lamb recipe with its mint condiment that we really appreciated its beauty. It's something we imagine on the Sunday table of Mayor Drapeau, who brought Expo 67 and the '76 Olympics to Montreal (and chased away the hookers and the gangsters -- albeit temporarily). Looks delicious, but where do the artichokes, snow peas, and baby turnips come into play? Braising is my new favorite thing (I know, I'm way behind). I'm going to have to try this. Thanks so much for sharing!